I haven’t written an “essentials” post in a while. These are posts in which I reflect on a wide range of things that are essential to my writing life. So far, I’ve tackled the double asterisk and my wonderful critique group — a wide range indeed. Today, I turn to the rich community of fellow writers who offer wisdom and support and steady shoulders to stand on. Writing can be a lonesome task. I spend hours alone with my computer and my writing journal and my imagination. I happen to have a job that puts me in almost daily contact with people who love books and writing, but many writers aren’t so lucky–some have jobs that give them little creative sustenance; some spend all their time writing and thus nearly all their time alone. Perhaps because of this isolation, writers are often eager participants in formal and makeshift communities. These might be critique groups that meet regularly or casual gatherings of fellow writers who happen to live near one another; regional or national associations like the Society of Children’s Book Writers and Illustrators that host online communities as well as conferences; workshops or classes or residencies; or any number of virtual communities, support and friendship offered via listserv, guest post, and tweet. I have benefited from all these types of communities, and I could devote a post, or several, to each one, but for now, I will highlight three. I cannot say enough good things about the workshops and space offered by the Highlights Foundation. 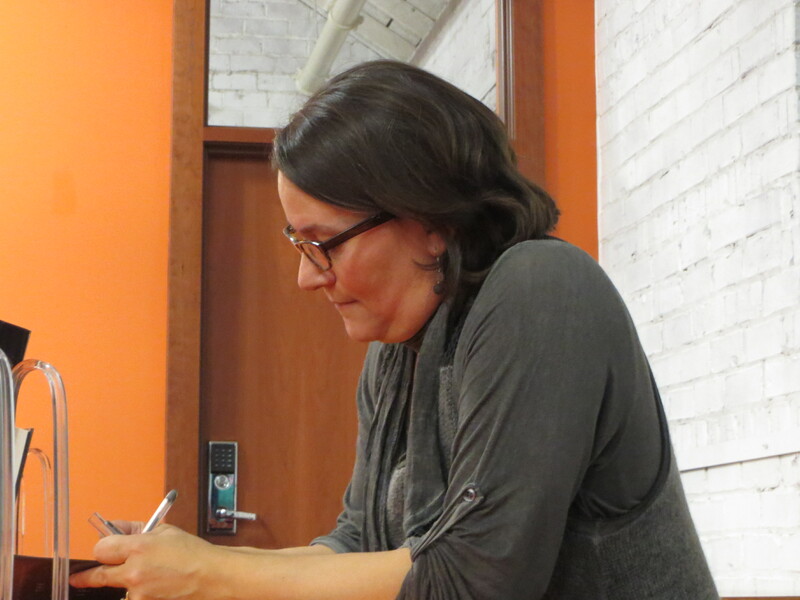 I attended a week-long whole novel workshop there in 2014 with faculty mentors Laura Ruby and Anne Ursu. 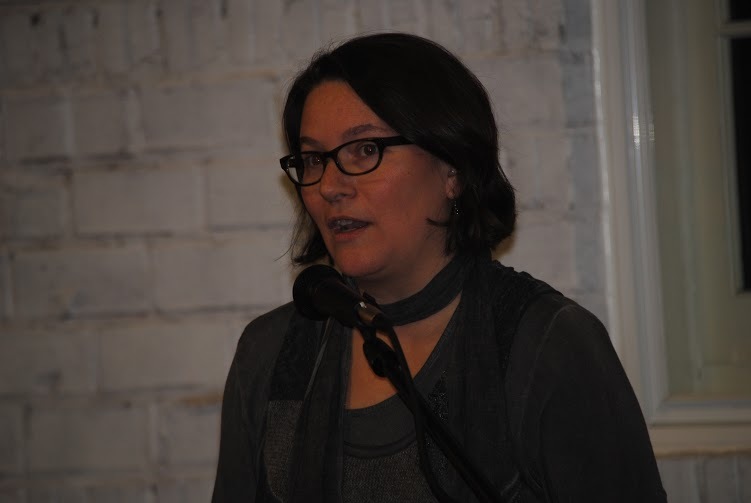 The workshop advanced my understanding of the writing craft, offered invaluable feedback on my work-in-progress, and provided me with friendships that continue to sustain me. When I have felt overwhelmed by unexpected turns in my writing life, I have called upon the community I found at Highlights and I’ve been grateful to discover that community is with me still. So grateful, in fact, that I returned to Highlights a year ago for an “UnWorkshop,” a time to write in the peaceful environment they provide, fed by their fabulous chef, and free from the distractions of my regular life. A most delightful and unexpected bonus was that a small group of women I happened to have met years before at the Eastern PA SCBWI Pocono Retreat was UnWorkshopping at the same time, and I had the chance to reconnect with this wonderfully supportive community of writers. 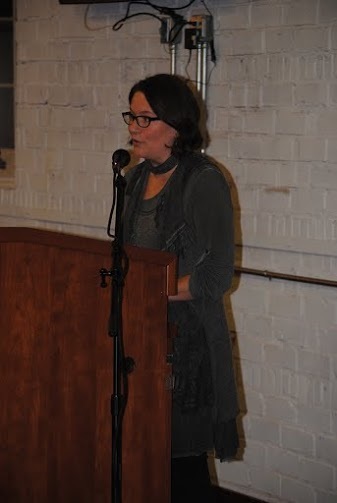 I am hopeful I can get to Boyds Mill for another UnWorkshop soon, and even if I can’t make it back there for awhile, Highlights and the people I met there will always be a vital part of my writing community. Fearless Fifteeners is an online group of YA and MG authors whose works debuted in 2015. 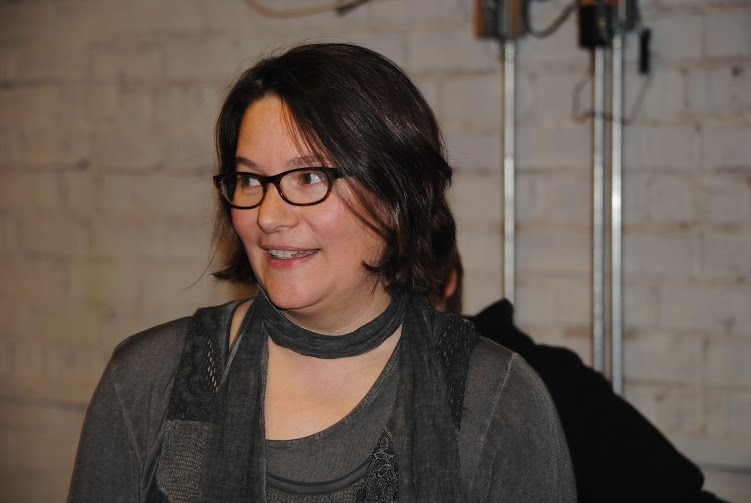 I came to the group fairly late in the year–I learned of its existence while at the Highlights UnWorkshop, actually–but they welcomed me, and I have found the group incredibly supportive. This community provided publicity when my book came out, and it has been a great resource. On our private proboards, we post questions and share problems, garnering the advice of writers who also have recently negotiated contracts, are trying to figure out how to approach booksellers, struggle to digest reviews, have great tips for school visits, etc. Sometimes the person you most need to talk to is the person who just moments ago was exactly where you are now. Fearless Fifteeners has been that community for me. At the other end of the spectrum are people who I knew before any of us were writers. I happen to have two good friends who have become children’s authors, but I knew them back when they were just regular people doing other things. Both of these people are veteran authors now, and both have been extraordinarily valuable resources for me, generous with their time and wisdom, offering advice about the craft, business, and pleasure of writing. The guidance and friendship of these people who know me as me yet readily accept me as writer has been a bedrock as I’ve built books. It remains true that I mostly write alone, but, as you see, being a writer is not at all lonesome. I am buoyed by the kindness and wisdom of many author-friends, and I take pleasure and strength from my conversations with them. Whether we are talking about books we love or figuring out how to write books other people will love or trying to find the best ways to reach the readers who already love our books, we love talking with each other, sustaining each other, and building together a community that loves and makes and celebrates books. 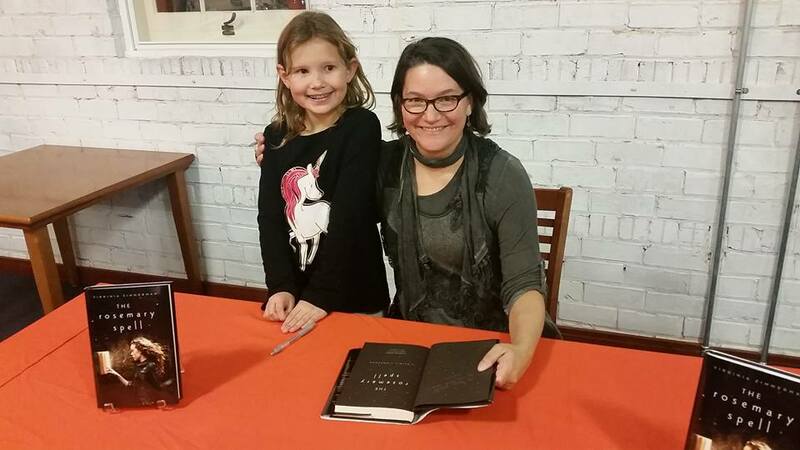 It’s been one month since the wonderful launch event for The Rosemary Spell, held December 4th at my local Barnes & Noble. I’m so grateful to all the people who came–there was standing room only! Here are just a few pictures. Enjoy! 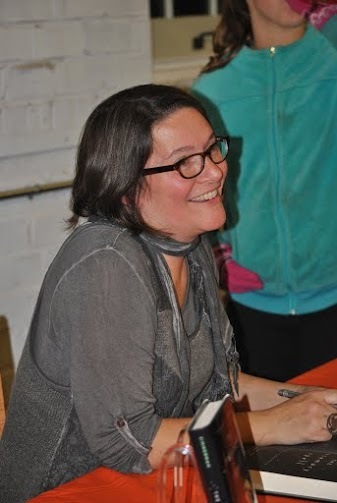 If you’d like me to speak at your school, library, or bookstore, please contact me at vzauthor@gmail.com. A book is a magical thing conjured when the imagination of the author meets the imagination of the reader. For The Rosemary Spell, the magic begins today–December 1, 2015, the official release day. Advanced review copies have been available for a few months, which means a fair number of readers have already had this book in hand, but today is the day the book can be purchased by anyone. Today, the book is released into the world. Authors commonly liken publishing a book to having a baby, but today, I find more apt the metaphor of pushing a young bird out of the nest. I’ve done all I can for the fledgling, and, with considerable help from family, friends and all the wonderful people at Clarion/HMH, I’ve readied it for its journey out into the world. Now, it flies free, out and away from me. It flies into the arms of readers who’ve been waiting for it and readers who don’t know yet this book is gliding in their direction. I hope it will still be fluttering around many years from now and will perch on the fingers of readers who aren’t yet in the world themselves. As The Rosemary Spell leaves the nest, it leaves me, in a way. It soars outward and becomes a thing that belongs to its readers. Each person who turns the pages of this book will find something unique inside and will thus make the book his or her own. Some of these readers will share their impressions with me or with the world, but most will not, and I will never know exactly where my book flies and lands and maybe even makes a nest of its own. So, today, I hold my breath and watch The Rosemary Spell go. There is great solace in focusing on the helpers. The helpers are people who choose good when others have unaccountably chosen evil. The helpers are people who, with bandages and kind words and leadership, start to put the world back together. There is also great solace in books. Along with Mr. Rogers’s exhortation to look for the helpers, an image of the Paris bookstore Shakespeare & Company has been flying through the ether of our shock and sadness. 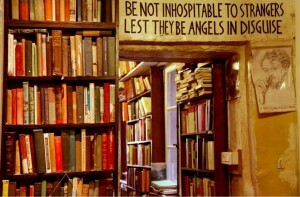 BuzzFeed tells us that the bookstore sheltered people during the attacks, and the story has traction partly because of the sublimely appropriate words on the wall, but mostly, I think, because it resonates with a deeply held truth: we recognize that books have the power to shelter us. 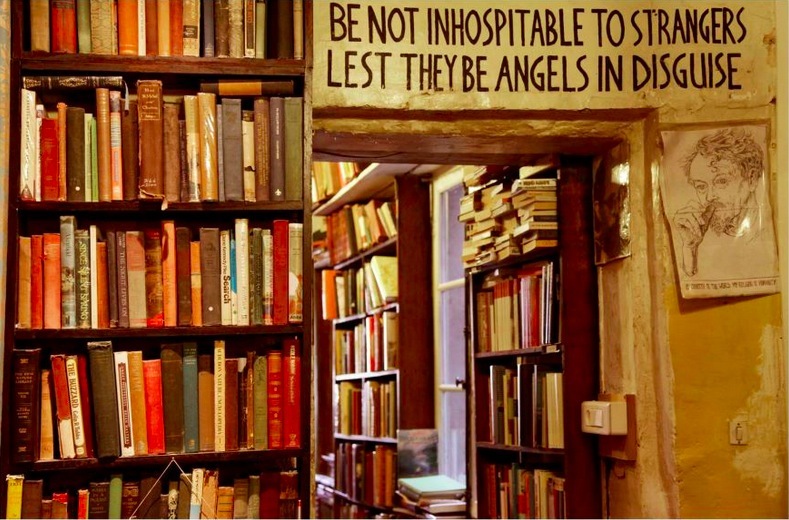 When Shakespeare & Company took people in, the store made literal the metaphoric work of books, which save us and sustain us in so many ways. In times of crisis, we turn to books for comfort or catharsis. We learn from books how to face villains, how to be heroic, and how to live our regular lives with grace. Books give us insight into the lives of people different from ourselves, and they teach us to value those differences. Books anchor us and save us all the time, in ways that are seemingly inconsequential but that matter deeply. They make us who we are. They make us better than we were. It is no surprise that a bookstore would be a refuge. It is the most natural thing in the world that people would find safety in a place filled with words and stories and knowledge and hope. I’m sure Fred Rogers knew that books are helpers, too. I wrote a post years ago about receiving a big box of books. Collected by a dear friend and signed by the authors, this box was a gift of words and strength. Yesterday, I came home to find a similarly sized box. It was marked by the telltale geometric logo of Houghton Mifflin Harcourt, and I knew right away what was inside. But how could it be? The Rosemary Spell doesn’t release until December 1. How could it be sitting in my foyer? I dropped my grocery bags and ran to the kitchen. I used scissors to open the box, eager but careful. I pulled back the cardboard flaps, and there they were. Stacks of my book. The Rosemary Spell. This box of books is different from that one I received years ago because all the books in the box are the same, and I wrote them. But its arrival similarly marks the end of a long journey, and it is also a box filled with words and strength, strength I drew from so many places, including the wonderful books that have meant so much to me throughout my life. 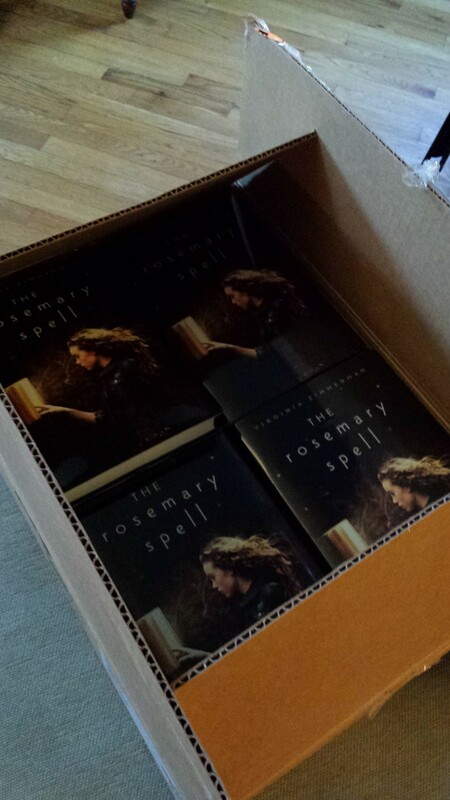 Seeing the books in the box, imagining each copy in a reader’s hands, I dare to hope that The Rosemary Spell will go out into the world and matter to people. When I think of all the books that have been packed in boxes and shipped all over the world to homes and stores and libraries and schools, I can’t help but marvel at the company I’m in. Books carry whole lives and whole worlds in their pages, and receiving a box of books, cutting through the tape, pulling back the cardboard is akin to opening up the world. The Rosemary Spell will not be available to the public until December 1st, but it waits, ready to give words and strength to all who open the book and unpack its story. When I was in college and started doing serious writing, which always means doing serious revising, I devised a slate of symbols to indicate spots where text should be inserted. Most of us use the asterisk for this purpose. However, if you’re making substantial changes, you need more than one symbol. I would start with an asterisk, then go to two asterisks conjoined like a mutant snowflake. Three asterisks seemed like too much, so I went on to a sort of cross with two horizontal lines, then a filled-in triangle, and finally a filled-in circle. With these symbols, I could make five insertions per page. Very occasionally, I would need even more, in which case I used capital letters with circles around them. I am now in the process of revising a manuscript, and today my goal was to combine two chapters, taking out some material and bolstering an under-developed plot. This is precisely the sort of revising that involves lots of insertions, so I fell back on the tried and true approach described above. I doctored this image because the manuscript isn’t yet ready to be read by the general public, but I think you can still make out the many insertions, each with its own symbol. It felt really good to return to this method of revision. There was a muscle memory to it, for my hand but also for my brain. It seems silly to feel invested in an assortment of symbols, and not especially original ones either, but having so many ways to indicate that text should be added is a way of giving myself permission to make major changes to a text. Once we craft sentences and paragraphs, it is painful to break them open, shift around their parts, bring in new material, and delete forever much-loved turns of phrase. But this is how writing gets to be good. This is how a subject, verb, and a handful of other parts of speech transform into phrases stitched on throw pillows, epigraphs for the next generation of authors, or, simply, words to live by. 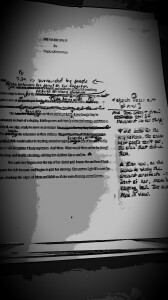 It is in revision–serious, phrase-rending, up-to-five-insertions-per-page revision–that writing becomes art. This post is the first in a series devoted to the various things that are essential to my life as a writer. These things range from teaching to tea, and today’s topic is my critique group. Some critique groups have names—The Front Street Four or The Writers of Rohan—but we never settled on a name. We never even tried. And now that I think about it, I don’t believe it would be possible to encapsulate who we are and what we mean to each other with a clever label. 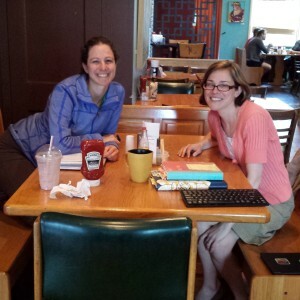 All of us write for children, and we found each other through our regional chapter of SCBWI. We’ve met more or less once a month for four years, and we are frequently in touch by email in between. There were four of us for a time, but now we are only three, and that feels like the right size for us. We can usually find time to read whatever the others have written, and when we meet, each person’s work gets the attention it needs, with time left over to talk through anxieties and aspirations. I have other people in my life who read what I write, and I am grateful for their time and their insights. They give me great suggestions and ask important questions. But they only walk along with me for part of my journey. My critique group walks with me always. They read everything I write. They read rough attempts at first chapters that are quickly abandoned and last versions of polished work before it goes out to an agent or an editor. They read whole novels, and they read them several times. Because they’ve been there from the beginning of a book and they’ll be there at the end, they can ask hard questions and say things other readers often can’t or won’t. The best recent example is when both of my critique partners independently suggested I’d chosen the wrong main character for my just-finished novel. They were right, and as I rewrite this book, they are with me, pointing out where I can do better, but also and always cheering me on. And they have become good friends, which is important because sometimes life gets in the way of writing or sometimes facing the hard things in life is the only way to write. There is no name for what we are: honest readers and friends, long-term critics and counselors. We three together—whatever we are—are essential to my life as a writer. I wrote recently about my favorite exercise for crafting character–100 Declarative Sentences. If I don’t say so myself, I was rather eloquent about the magic that happens when I’ve made 70 or 80 statements about a person. However, today I hang my head in shame and confess that the last two times I did this exercise I allowed myself to stop at 50 sentences. I felt I knew the characters well enough, and continuing to proclaim facts about them seemed too hard. As in many life situations, the thing that seems hard is precisely the thing that needs doing. Not knowing what to write next was the reason to push myself to figure it out. If I had really known the characters well enough, I would have been able to complete the exercise. And if I’d kept going, I might have discovered the difficult truth I’ve only just realized: that the wrong person was the main character. In fact, now that I reflect on my process, perhaps I saw that truth hovering at around #65 and turned away from it, convincing myself that 50 declarative sentences was enough. I gave myself permission to stop short of the hard part of the exercise, and now I must do a much harder thing. Having finished the novel, having spent 10 days basking in a triumphant glow, I take a deep breath, ready my notebook, open a new document and start over. 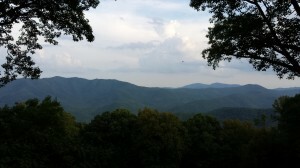 I spent the past week at the Wildacres Retreat in the mountains of western North Carolina enjoying the wonderful gift of a writing residency. 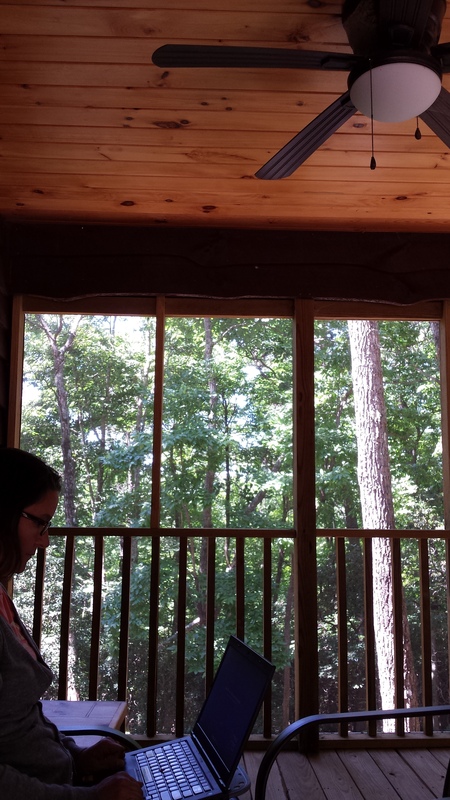 I had my own beautiful cabin where I spent hours every day writing on the screened porch. I walked in the woods and saw a doe, a turtle, a wild turkey, a scarlet tanager, and a blue-tailed skink, which sounds made up but isn’t. I enjoyed meals and conversation in the lodge with the Wildacres staff and two other “cabin-dwellers,” both writers like me. 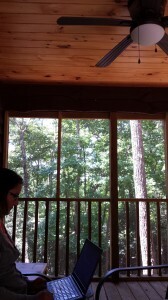 I also enjoyed sounds of flute and saxophone that drifted down to my cabin from the Retreat above. During the week of my residency, Wildacres hosted flute and saxophone master classes, culminating in a concert Friday night, which I was lucky enough to attend. The whole concert was wonderful, but I was especially impressed by the New Century Saxophone Quartet which played “O Northern Star,” written by the Tenor Sax about Wildacres. You can see a video of them performing the song at Wildacres here. A writing residency is a miraculous thing. It is time and space, both valuable commodities for any writer. It is also faith. Because residencies are competitive, being selected means a committee of smart people who care about art assessed my application and decided they believed in my work. This faith makes it possible to use the time and space well. One of my fellow cabin-dwellers said on arriving, “If I can’t write here, I can’t write anywhere.” But it’s not just the inspiring place and the gift of time that matters. It’s also the fact of having been chosen to be in this place. So what did I do with my time? I worked on a middle grade novel called (for now) THE OATH STONE. It’s about facing fear and finding the stories in remnants from the past. While at Wildacres, I wrote the last third of this book, and then went back and revised the whole thing. It’s ready now for my critique partners and a first round of readers. And I’m ready for my next project. 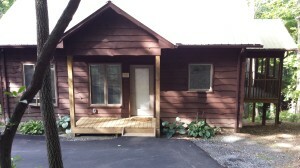 Thank you Wildacres for time and space and faith. I hope I fulfilled your expectations. You absolutely exceeded mine.